Published by Cyril Huze May 19th, 2016	in Builders and Editorial. 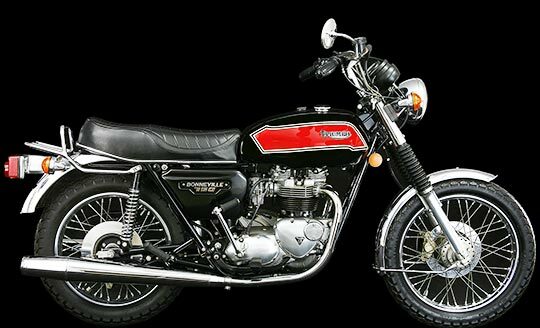 The Triumph Bonneville T140 is a 750 cc (46 cu in) capacity 360-degree, air cooled parallel twin engine motorcycle produced from 1973 until 1983 when the company declared bankruptcy. Twin Amal carburetors supply the cylinders through short intake manifolds. The 19 inch diameter front wheel and 18 inch rear wheel were spoked with optional cast alloy wheels available from 1979 onwards. The under-seat area is occupied by the battery and ignition coils. My Son has one of these disc brake 750 5 speed Bonnievilles in the garage. Still a good performing motorcycle with above average looks. One has to wonder why they went belly up. Parallel twins were simply not competitive in the HP wars of that era. Great balance & handling didn’t mean much to potential customers who could only ride in a straight line. Got one in the garage that took me to work every day for many, many years. Could tear up the back roads on weekends with the best of em. And took me camping all over Nor-CA and southern Oregon on vacations.